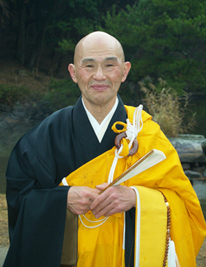 Shodo Harada Roshi  Japanese Zen master, is the Abbot of Sogenji Monastery in Okayama, Japan, and dharma heir of Yamada Mumon Roshi, one of the great Zen masters of the twentieth century. In this video, we watch him guide thirty-five Americans through a five-day meditation retreat or sesshin, and hear him explain the practice of Zen, his own evolution, and the importance of the Zen practice to the world today. One Drop Zendo is Harada Roshi's worldwide Zen Buddhist community. "Everyone is capable of sensing the situation in the world today. There is no one who cannot sense the very deep despair that everyone feels. But it is not a question of only fixing what is external. It is a question also of going within and taking care of the egoistic source of these external problems. "Today there are a lot of things that are being taken care of on the outside. There is a lot of healthy food being eaten. There is a lot of care being taken to preserve our planet. People are coming to the consciousness that is needed to address these external social problems…but even if these efforts go to even greater lengths than they are going to now, if we don't take care of the problem within ourselves, it's not going to work. "No matter how much external work is done, if what's happening inside isn't being repaired, then it's not going to work… It's not going to solve the inner problem. The inner problem is something that each person has to do for themselves. And that is the problem of the heaviness of the ego. There is no one who doesn't feel that…"